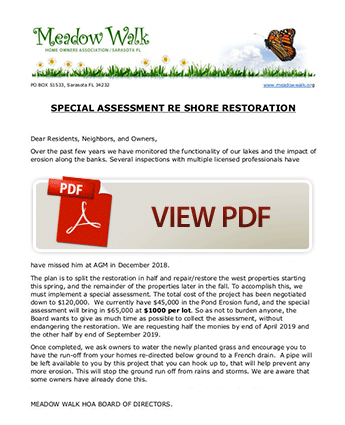 In February 2019, a Notice of Special Assessment was sent to each lot owner in Meadow Walk. Each lot is being assessed $1,000 on a one-time basis. Update: The Notice indicated that a representative would be in attendance at our next meeting of the Board of Directors on March 26th. Unfortunately, due to unforeseen circumstances, the representative is unable to be present at that meeting; however, the Board of Directors will be available to answer questions from members of the Homeowners Association who attend. The vendor that we have contracted with is Crosscreek Environmental. Any homeowners whose properties back up to the affected waterway that wish to connect their drainage to the system that is being installed are invited to contact the company for a quote. Their phone number is (941) 479-7811. Why is there a special assessment? The Meadow Walk Homeowners Association is faced with an urgent need to address a problem with our community’s stormwater management system before costs escalate even higher. Funds which have been set aside in previous years and held in reserve have proven to be insufficient to cover the cost of the needed repairs. An ongoing problem with erosion has been developing over many years now. This issue affects a critical stormwater drainage area along the west side of the southern border of our community. At different times, various experts, engineers, County officials, and others have been brought in to evaluate the situation. The problem has now become severe enough that it must be addressed before the cost to repair it becomes even greater. After evaluating a number of options, the Board of Directors ultimately selected a firm that specializes in this type of repair and negotiated significant reductions in the proposed fees. The final fee for this project is approximately $120,000. Who decided to assess this fee? During the most recent meeting in December, the Board of Directors voted to proceed with the repairs. Since reserves were insufficient to cover the cost of the repair, it was decided that each lot would be assessed $1,000. This was preferable to raising the annual dues each homeowner is required to pay every year. My lot is not affected. Why am I required to pay? 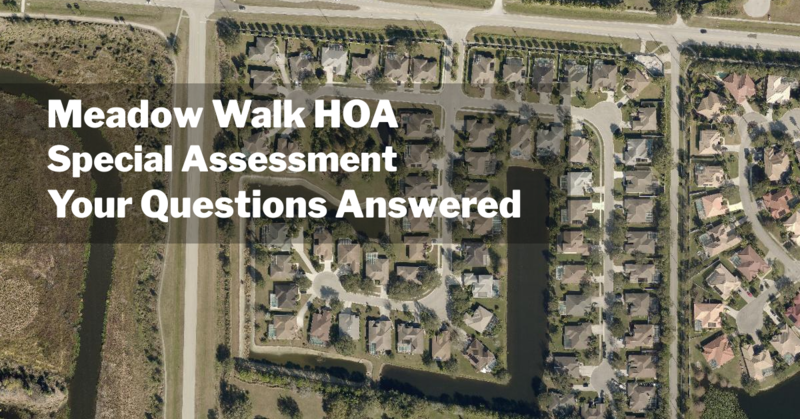 The erosion problem affects a portion of the stormwater management system for our neighborhood, which is one component of the “Common Areas” that the Meadow Walk Homeowners Association owns and is required to maintain. Every homeowner in Meadow Walk shares in the responsibility to maintain the Common Areas, regardless of the location of any individual lot. (c) Each assessment shall be the personal obligation of each Owner. If the assessment is not paid within thirty (30) days after the delinquency date, the Association may, in addition to any other remedies it may have, bring an action against the Owner to collect the amount due. The Association shall be entitled to recover, in addition to the assessment any interest, all costs and attorneys’ fees incurred in collecting the assessment. Why is this not covered by the annual dues that I pay? While a portion of the dues paid by members of the Meadow Walk Homeowners Association has been diligently set aside each year to prepare for large expenses, the cost of this repair substantially exceeds available reserves. I pay $600 annual dues, but I don’t see anything being done. What happens to that money? Annual dues paid by each homeowner every year are used to cover all the costs incurred by Meadow Walk Homeowners Association each year. These funds are used to pay for everything from electricity to operate street lights and sprinkler systems to mowing grass and maintaining landscaping in common areas. Additionally, the Board of Directors sets aside a portion of the dues paid by homeowners each year to hold in reserve for larger expenses, including maintaining the wall along Palmer Boulevard and the stormwater management system. A detailed budget is available for inspection at the Annual General Meeting, and the Treasurer provides a report at each meeting of the Board of Directors. When must I pay the Special Assessment? Under the terms of this Special Assessment, each lot owner is required to pay $1,000. The assessment may be paid in two (2) installments of $500.00 each, with the first installment due April 30, 2019, and the second installment due by September 30, 2019. Alternatively, payment in full may be made effective immediately. When does the next Board Meeting take place? When does work begin on the needed repairs? Work is scheduled to begin in mid-March, 2019.